Just a quickie today, aimed at you girls out there! Need something to take away all your makeup on a night time before you start your skincare? Well look no further because I have the product for you. The body shop have an amazing range of cleansers, from balms, to creams, to oils, to gels. However, there is one that stands out among the others that is well known by beauty bloggers and enthusiasts. 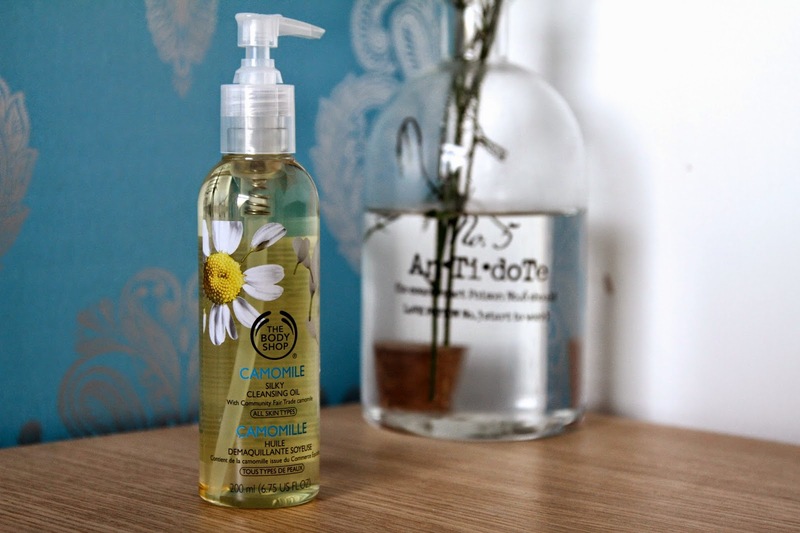 The Body Shop Camomile Cleansing Oil. I’ve already done a review a few months ago on the Camomile Cleansing Balm, however this is completely on another level. This is a cleanser I’ve had sitting on my sink a few months now and I just haven’t being able to find the words to describe how good this actually is. The texture of this oil is light and soothing. If it can be possible, this oil almost doesn’t feel greasy or oily. It completely takes away all the dirt from your face in one go and to all of the ladies I’ve spoke to about this, strips your makeup away in a breeze. What more can you ask for? Its the perfect product to give you a clean base to work on either in the morning or after a long day. This little gem is also very suitable for people with sensitive skin, so it really does suit all. I can guarantee this product will work for you either for a quick cleanse or an effective makeup remover. Try it, and you’ll be amazed!